This is a Photoshop Scrapbooking class brought to you by the absolutely fantastic CreativeTechs in Seattle. The classes are live and free! I attend as many as I can and have learned so much to use with my collection of family and old photographs. 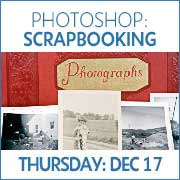 This particular class is pertinent to those who scrapbook with old photos. I highly recommend taking the class. Oh, and did I mention, the class is free! Jason Hoppe shows you how to use the brushes, layer effects, smart objects, and blending modes in projects. This course focuses on Photoshop CS4. 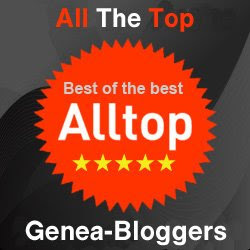 Most (but not all) of the tools and techniques are available in Photoshop CS3 and CS2. Note: This is not a Photoshop Elements course, although a few techniques may be relevant. Cost: The LIVE class is FREE to attend! The downloads are available for $15 per class, or $45 per 5 week course, or $150 for the entire 6-month course… or, get an all-access pass for just $50 a month!